Point Loma parents on Thursday made a passionate plea to save a popular pump-track bike park they made for their kids on city-owned land. 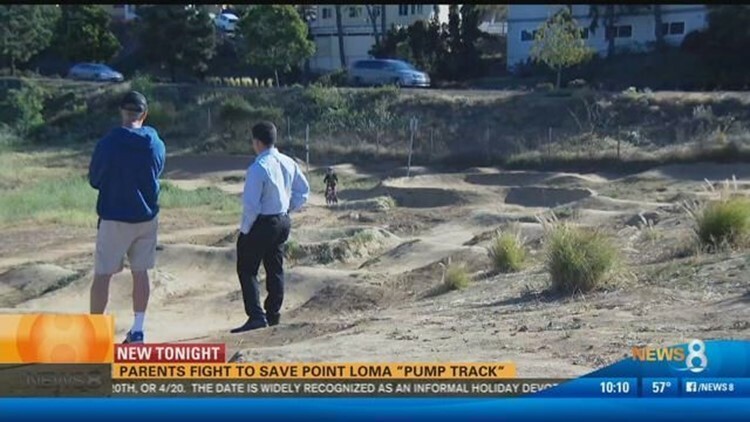 POINT LOMA (NEWS 8) – Point Loma parents on Thursday made a passionate plea to save a popular pump-track bike park they made for their kids on city-owned land. That land is now set to be developed into affordable housing, but parents are pushing their community’s planning group to step in and help save their kids’ track. Last month, parents received a reminder that the area was owned by the San Diego Housing Commission. Point Loma families were able to stall demotion of the track for now, but according to the commission, the land is designated for an affordable housing project. Katie Bendixzn is one of the many parents that takes her kids to ride the track. She wants the commission to prove they have the right to build there in the first place. “I just want to know that the legals are all done correctly – that the numbers are going to match,” she said. Bendixzn first took her fight to save the track for the kids to the Peninsula Planning Board to ask for back-up. “Hopefully the San Diego Housing Commission and their land czar do not feel the need to go demoing anything right now,” she said. The San Diego Housing Commission said in its statement the housing project is in its pre-development state. Once completed, it would include 78 units.